An excellent little horror story; starts ~4min 30secs into this episode of Tales to Terrify: Tales to Terrify 306 Liam Hogan Franz Kafka. This podcast is usually pretty solid, if you like straight-up traditional audiobook-style readings of short horror fiction. Puts me in the mind of Kathe Koja’s The Cipher—but more for art reasons than horror reasons. 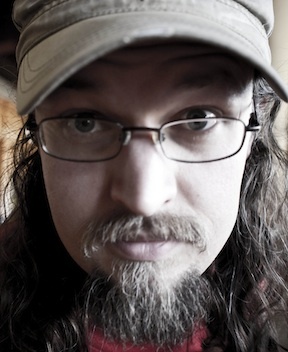 F&SF Interviews Dave-o about Witches, Guns, Lawyers, Ohio Militias, etc. I totally hear where folks—angry, aggrieved, not-gonna-take-it-anymore folks—are coming from, because I totally agree with them: They are getting screwed. We just totally disagree on who is screwing them, or what is a sensible way to address that. This story is about that, in a fundamental way. I also tell an anecdote about seeing a homeless guy get ejected from a Coney in the mid-1990s, and make mention of Michigan trespassing laws, the sovereign citizen movement, my neighbors from Chennai, and Dave-o’s patented “magpie and junk drawer” speculative-fiction drafting strategy. 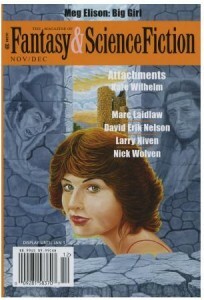 The Nov/Dec issue of F&SF is still on newsstands—but only for a few more days. Nab your copy soon! When disturbing stories about respected artists come from the distant past, we treat them dispassionately, as just one detail among many. Present tense or near-present tense revelations hit us differently because we share the same world as the artist, breathe the same air, feed the same economy. We think of them as contemporaries, even as people we know. This kind of revelation changes the relationship between the artist and the art, in a way that places an unasked-for, unfair burden on the audience. This is what’s happening culture-wide. And it’s not the fault of people who didn’t report it, or audiences who aren’t sophisticated enough to separate the art from the artist. It’s the fault of the artists for being secret creeps or criminals, and the fault of the system for making it possible for them to act this way for years without being punished.